Welcome to the PROPHETIC MINISTRY website! Our sincere desire is that you will hear the Lord and be drawn to Him in all that we are presenting here. While David was writing notes for a sermon in 1995, he began to write down thoughts as they came from the Spirit and he noticed that he had written them down in the first person, as though God were speaking directly to him and the people of the Church. He knew these were very special words from God and was encouraged to share these thoughts, word for word as he had written them down. Soon, wherever David would go, the Lord would give him prophetic words for churches, conventions, Bible colleges, home fellowships, wherever Christians were gathered. Now, there are about 150 written, prophetic words since 1995, available upon request. We will send them through the mail to you or through your e-mail. For the last 8 years (from 1999 to the present): David has traveled throughout the United States, often in major cities and in capital cities, as he has been led by the Lord. He has talked to church and home group leaders, and has met with many individuals and groups who are hungry for PERSONAL AND CORPORATE REVIVAL. Our desire is that there would be a spreading, fire of revival in every heart and in every place. We look forward to hearing from you and seeing how our spiritual gifts can help each other, and how the purposes of God can be accomplished in your area. In March of 1969, David came to know Christ at 19 years of age. He was born again and the fire of God was in him. He worked as a youth leader, went witnessing, and switched colleges to study the Bible. In June of 1969, Sybil came to know Christ as her Lord and Savior, she was born again. She has been involved in Christian ministry since that time. Initially, she was part of a local church evangelism team and then a member of Huron Valley �Youth for Christ� in Ann Arbor, MI. They used contemporary Christian music and bible studies to present Christ to high school and college students. Sybil has worked for many years in church leadership, administration, worship and praise, and hospitality. 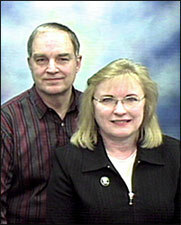 She has traveled extensively throughout the United States with David on ministry trips. (David Nelson is a member of their Board of Directors).